Just $29.90 - No Subscription - That's it! Get real time info, stats, and notifications! etter than a code reader. With eDriveCARE, your smartphone becomes your car's best friend. 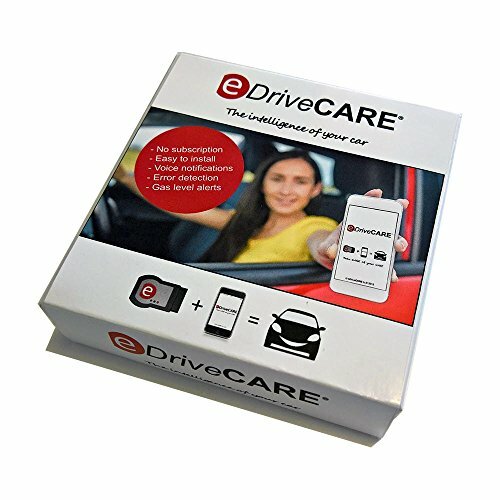 Your eDriveCARE package includes a small device to plug into your car and the instructions to install the application on your smartphone. eDriveCARE is compatible with most of the cars manufactured after 1996. It features instant detection and notification of advanced issues concerning engine faults but also advanced issues related to airbags, tire pressure, oil change and many other features on selected cars. eDriveCARE is currently available for iPhone (iOS 8+) and will be available for other platforms soon. How to remove the Check Engine light (MIL), Service Engine Soon and airbag lights on your dashboard and how much it will cost to fix the issue! A subscription free, total price of less than $30! No subscriptions or additional fees needed! Compatibility with all mobile carriers! A highly secure and performing system! Uses WiFi not Bluetooth. Tracks the vehicle health, not you. We are not collecting/sharing drivers behavior with Insurance or other companies. Small enough size that you won't even notice it while driving! Automatic shutoff to avoid draining your car battery! A background notification system with voice, so you can use other apps like Waze, Maps and listen music at the same time! The most affordable solutions to fix your car's issues and save money! Manage all of your cars in one simple app! Small app size (8MB) to take care of your phone storage. Universal Starter Pack for iPhone and Android will be available soon, if you want more details about Android support, upcoming products and availability in your country, contact us!